NPFL's most expensive player, Godwin Obaje Photo Credit: Ojeikere Aikhoje FC Ifeanyi Ubah gaffer, Yaw Preko, is satisfied with the performance of the league’s most expensive player, Godwin Obaje, after making his debut in last Sunday’s Oriental derby against champions, Rangers. </> Unveiled before kick off, Obaje was a second substitute who earned the team a penalty when Rangers’ Ghanaian goalkeeper, Nana Bonsu, was adjudged to have fouled him by centre referee Patrick Ishaya. FCIU winger, Prince Aggreh, converted the penalty for the only goal of the match. 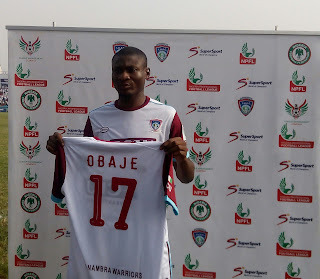 “I am satisfied with Obaje’s performance. He trained with us for three days before his debut. 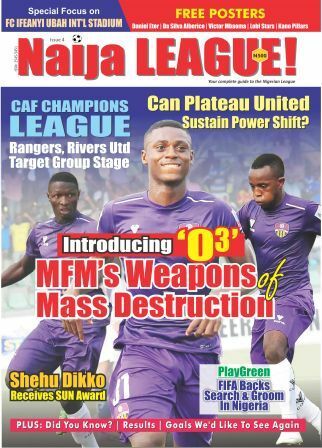 “Obaje is a big and powerful forward, who will do a lot for us”, the former Ghanaian International told naijaleague.com.ng. Rangers defender, Pape Ousmane earned a second yellow and a red card after he was adjudged to have fouled Obaje in an off-the-ball incident by Ishaya.